Glide laptop shelf and durable rubber wheels. Designed to accommodate large-format, 12 in. DJ mixers, the ProX XS-M12LT features a convenient, sliding laptop shelf, and offers uncompromising protection while giving your DJ setup a polished, professional appearance. You depend on your mixer for important gigs, and the XS-M12LT keeps it performing at its peak, night after night. Engineered for demanding use by professional DJs, the XS-M12LT is constructed with ProX’s rugged, signature 3/8 in. Certified Gig-Ready Series plywood. It features durable rubber wheels, reinforced steel ball corners, as well as recessed steel padded handles and latches. Additionally, there is extra space behind the controller to safely store your cables and small accessories. The removable front panel allows easy and immediate access to the front controls and headphone inputs. The laptop shelf is also removable and can be removed when slid out to its furthest point. This ATA-style, road-ready case has a sleek, professional look that is sure to turn heads and make your setup look legit. It’s manufactured with a unique honeycomb-pattern laminated surface design for added good looks and durability. Unlike standard laminated plywood ATA-style cases, ProX’s surface design helps prevent minor to mild scratches. As if manufacturing high-quality products wasn’t enough, ProX strives to be environmentally friendly as well. 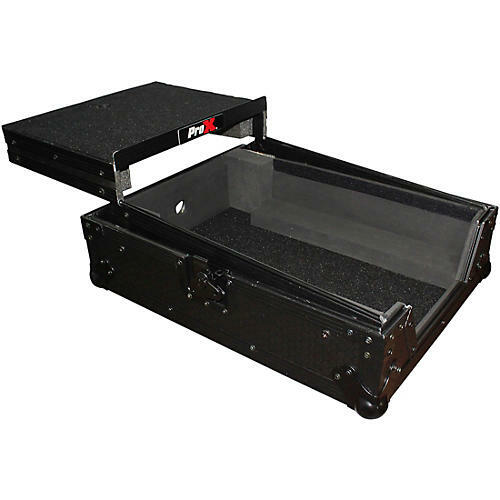 The durable hard rubber foams used in ProX cases contain 70% recycled content. Of that 70%, 80% of it comes from recycled plastic bottles and the remaining 20% from recycled post-industrial material. Give your mixer the protection it deserves—order today.